As you open up task manager in your Window operating system,you will found that there are at least three svchost.exe process are running.Sometimes we ever wondered what all those svchost.exe files are running ? There are a lot of information showed to you as using some enhanced task manager software such as system explorer and caused you more confused.Now you can try svchost viewer. 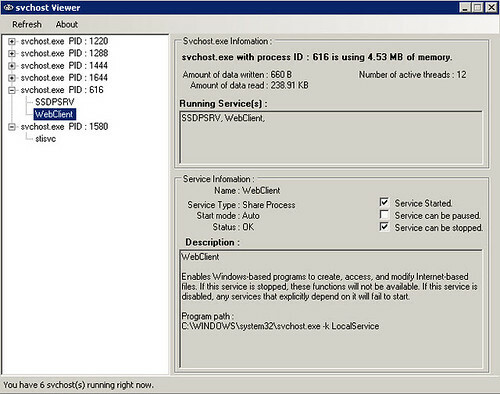 Svchost viewer is a simple tool showing svchost.exe details that running in your Window system.It will listing name,description,services and the program path. Download svchost viewer and work in Window XP and Vista only. It required have .net installed (ver 2.0 or newer). How To Perform Offline Window Update ? See also “Svchost Process Analyzer” from http://www.neuber.com/free/svchost-analyzer/. This apps analyse the svchost process a little bit deeper.